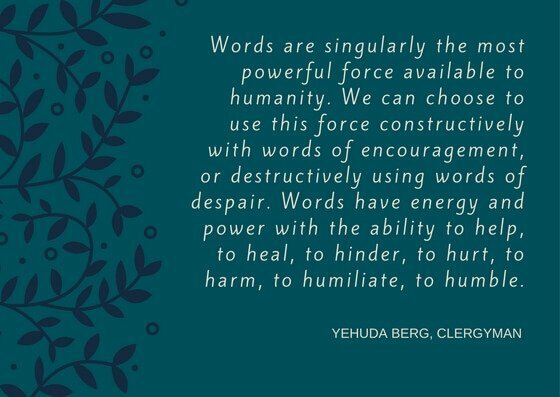 There is energy and power in our words. People around us tune in. Anyone who was paying attention in language class learned that words have two kinds of meaning. The obvious one is “denotation” which is the literal or primary meaning of a word, in contrast to the feelings or ideas that the word suggests. Those ideas or feelings are the “connotation,” the subtle meaning of the word—the overtone, undertone, implication, nuance or suggestion invoked by the word. Consider a couple health-related examples that illustrate these subtle differences. I suffer with migraines. vs I experience migraines. I’m a cancer victim (cancer survivor). vs I’m a person who has (has had) cancer. Do you notice that in each pair, the first (and most-common) way of stating the issue carries a sense of victimhood? Michelle Gielan, national CBS News anchor turned positive psychology researcher, is the bestselling author of Broadcasting Happiness. She brings together an interesting combination of perspectives to address questions such as “How can we deliver negative news in a way that empowers?” To my way of thinking, the second parts of the above examples do just that—they present ones’ condition in an empowering way, for both the individual and the people around them. They are uplifting in difficult situations. In the video that follows, Gielan demonstrates how small changes in our use of words can have big effects, and gives examples of practical strategies to use the principles uncovered in her research. Expect that good things will happen. Believe that your behaviour matters. If we can foster optimism in the people we care about, we’ll go a long way toward creating resilience that will help us navigate through this troubled world. Negative messages can have a negative effect on our energy, our stress, and our happiness. Geilen’s research showed that watching just 3 minutes of negative news in the morning means there is a 27% higher likelihood that 6 – 8 hours later we will report having had a bad day. How can we stay informed without getting depressed? Get news online. This gives you more control because you can choose the headlines you click and the sources you access. Choose content that will fuel you. Look for media sources that practice solutions focused journalism. They fuel you with inspiration by not only reporting what went wrong but showing you the way forward with stories about people who are effectively dealing with the situation. They include both the problem and potential solutions in the story. To explore more of Michelle Gielan’s ideas, go to her website, I enjoyed the free three-part series of short segments that you can get via e-mail by signing up at Broadcastinghappiness.com/happiness. This entry was posted in Mindset, Viewpoints & Thinking for Ourselves, Things to Think About, All Posts—newest first and tagged happiness, Michelle Gielan, Broadcasting Happiness, positive thinking, work optimism by Laurana Rayne. Bookmark the permalink. Thank you Laurana. I have been told that I am uninformed because I generally avoid watching the news. Just had a sense that it wasn’t good for me. Nice to have that feeling affirmed and some strategies for getting informed without getting sad. Getting informed without getting sad – what a powerful motto, Susan. It sounds as if you’ve found the key to being both informed and upbeat. Almost like having your cake and eating it too! How does it get any better than that?